T-WEB is Thoroughbred's Browser-based development system. It is an integration of several of Thoroughbred's development tools including: Thoroughbred Basic, OPENworkshop®, T-WEB compiler, TS WebServer and Dictionary-IV object definitions. T-WEB will enable you to modify existing and develop new Thoroughbred® based applications that will operate in a Web-enabled/Browser-based environment. The T-WEB generated code is a high-level event handler, where the event handler process supports the requests and messages from many browser users. This is where T-WEB moves beyond the concept of context. 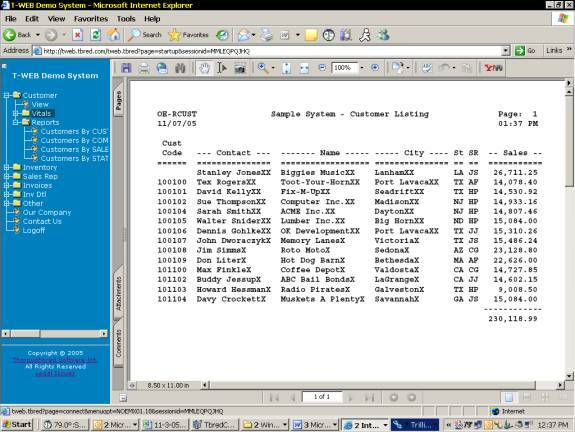 The basic client handles many user's requests rather than each user/session running with their own copy of Basic. The background Web Basic runs as a single control program. The control program is designed to know what process (or Method) can handle the request or event. The T-WEB code then generates the HTML code for the browser display. This is a paradigm switch for developers currently writing applications where the user directs or controls the application rather than procedural programs to control the users movements through an application. The application needs to support random access by a Browser/GUI user who can now click on any object displayed in the browser. Moveable, selectable iFrames offer great flexibility to the developer and usability for the user in navigating a T-WEB developed application. 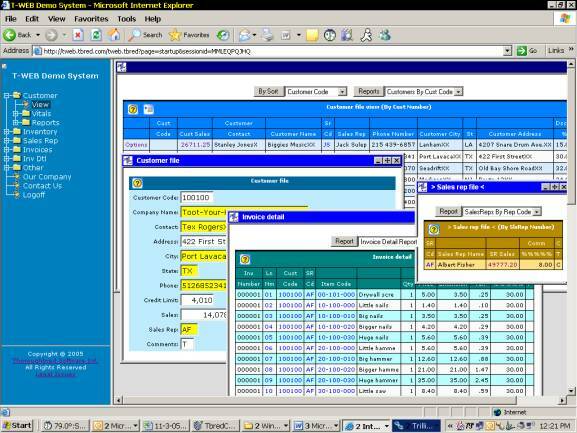 Multiple Frames (windows) can be opened at any one time, and selections and drill downs are effectively presented. 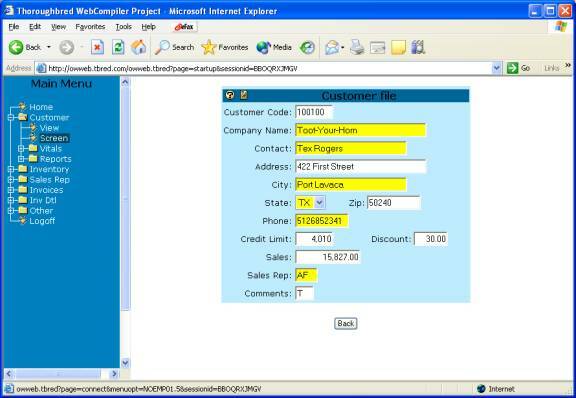 iFrames provide for multiple display frames (windows) that make your application user-friendly. Users will be pleased with the Drilldown support offered by table selections (VIEW's). 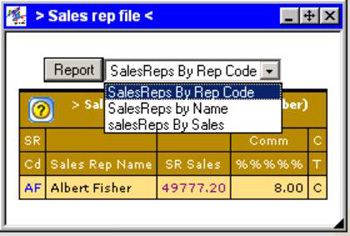 Drop down selections boxes make user options easy to use. Thoroughbred's T-WEB provides the tools needed to create Web/Browser ready applications, the ability to utilize and modify parts of your existing Thoroughbred applications, their business rules, and to develop new applications quickly and efficiently. Icons can be integrated such as the Help (?) button. 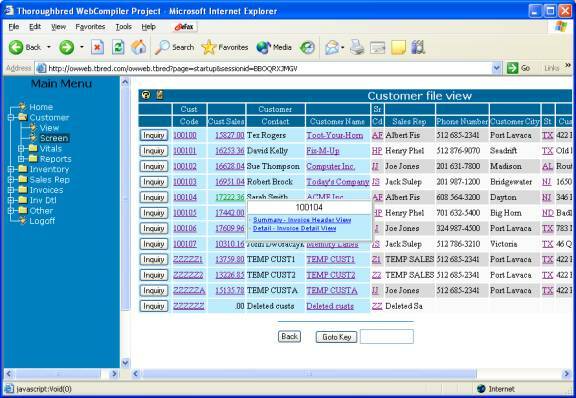 T-WEB can Generate .PDF formatted Reports automatically. Thoroughbred Developers can use our on-line T-WEB development site. Call your account representative for more details.